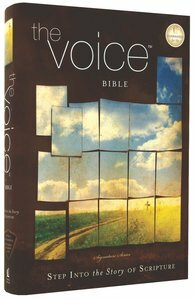 The Voice is a faithful dynamic equivalent translation that reads like a story with all the truth and wisdom of God's Word. Through compelling narratives, poetry, and teaching, The Voice invites readers to enter into the whole story of God with their heart, soul, and mind, enabling them to hear God speaking and to experience His presence in their lives. Through a collaboration of more than 120 biblical scholars, pastors, writers, musicians, poets, and artists, The Voice recaptures the passion, grit, humor, and beauty that is often lost in the translation process. The result is a retelling of the story of the Bible in a form as fluid as modern literary works, yet remaining painstakingly true to the original manuscripts. - Italicized information added to help contemporary readers understand what the original readers would have known intuitively. - In-text commentary notes include cultural, historical, theological, or devotional thoughts. - Screenplay format, ideal for public readings and group studies. The Voice? is a faithful dynamic equivalent translation that reads like a story with all the truth and wisdom of God's Word. Through compelling narratives, poetry, and teaching, The Voice invites readers to enter into the whole story of God with their heart, soul, and mind, enabling them to hear God speaking and to experience His presence in their lives. Through a collaboration of nearly 120 biblical scholars, pastors, writers, musicians, poets, and artists, The Voice recaptures the passion, grit, humor, and beauty that is often lost in the translation process. The result is a retelling of the story of the Bible in a form as fluid as modern literary works, yet remaining painstakingly true to the original manuscripts. Customer Reviews For "The Voice Bible"
I really enjoy this translation, one of my first after becoming a Christian. It actually does read true but it does have italic additions to help readers to understand the context, like as when the original readers may have understood it. Though sometimes more poetic and creative with structure, it is clear and great for devotional or personal reading, though not study. The screenplay format is great and again, makes it so easy to read and follow.